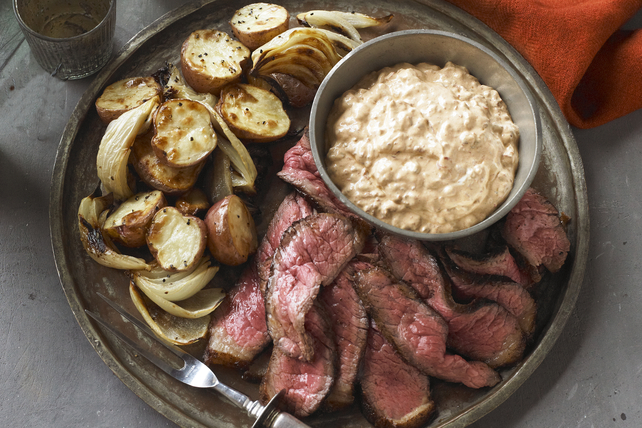 Warm up with Spiced Steak with Roasted Potatoes & Onions! Nothing beats steak with roasted potatoes and onions when you add in some chipotle pepper heat. Combine chili powder, oregano and 1/2 tsp. black pepper; rub onto both sides of steak. Refrigerate 30 min. Heat oven to 425ºF. Combine potatoes, onions, garlic, dressing and remaining black pepper. Place in shallow foil-lined pan sprayed with cooking spray. Bake 40 to 45 min. or until vegetables are tender, stirring after 25 min. Meanwhile, chop chipotle pepper finely; place in small bowl. Add sour cream, barbecue sauce and 1-1/2 tsp. of the adobo sauce; mix well. Refrigerate until ready to use. Heat barbecue to medium heat. Grill steak 5 to 7 min. on each side or until medium doneness (160ºF), brushing with remaining adobo sauce for the last minute of grilling time on each side. Remove steak from barbecue; let stand 10 min. Cut steak across the grain into thin slices. Serve with vegetables and sour cream sauce. Serve sliced steak on grilled Italian bread. Cut Italian bread into 3/4-inch-thick slices; brush both sides lightly with olive oil. Rub bread with cut edge of raw garlic clove. Grill on both sides until golden brown. Spread with some of the sour cream sauce; top with sliced meat. Serve as open-face sandwiches with potatoes and onions on the side. This spicy sour cream sauce is also great when used as a sandwich spread, topping for hot baked potatoes or dipping sauce for onion rings or french fries. Prepare using a variety of coloured potatoes, such as red, Yukon gold and purple. You can either create the mix yourself or purchase a pre-mixed bag available in the produce section of larger supermarkets.